Surprise! I made a super-quick trip to Paris earlier this month. I only told a handful of friends that I was going, since I had just 6 days to do what I do in Paris: which is nothing, blissfully. Or at least, nothing planned. Per usual, I didn't look at my watch (my figurative watch... I don't actually have one) the whole week. I floated around and remembered how much I love Paris in August, because it's quiet and empty, and it feels as if the city is resting, breathing and lying in wait. At night, you can walk and walk and walk and not see a soul. There's a stillness in the air—a non-energy—that makes me feel like I've entered an alternate Paris. It kind of feels like that scene in Disney's Sleeping Beauty where everyone around the castle is dozing (I love Disney... but only the old-school, politically incorrect stuff). The fact that many of my go-to spots are closed in August also led to two seriously huge discoveries. The first was Aux Deux Amis, a wonderfully understated neighborhood wine bar and resto that embodies everything I love about eating in Paris. The regularly-shifting menu is written in chalk, the waiters offer candid advice about what's good and what's even better, the place is full (but not annoyingly so), and we left feeling healthier, happier, and somehow lighter (the paradoxical effect of good French cuisine). Discovery number two was the mind-blowingly awesome Musée de la Chasse et de la Nature (Museum of Hunting and Nature). I really have no excuse for not visiting earlier: The moment I stepped inside, I felt like the place had been constructed, designed, and curated for me and me alone. 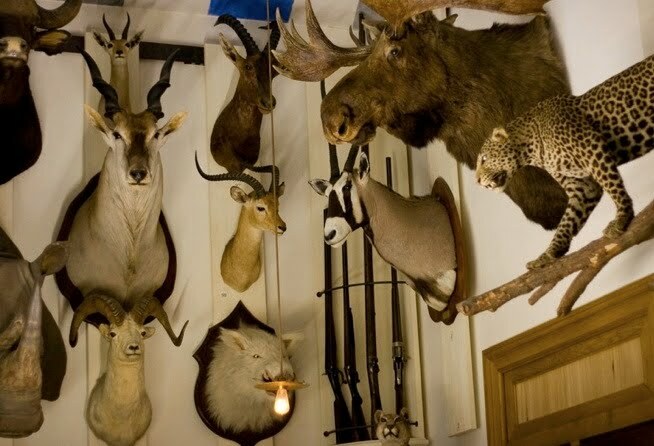 Its lavish interiors are filled with taxidermy animals of all shapes and sizes (fox! polar bear! owl faces on the ceiling! ), ornate weaponry and other "curiosities." And you can touch things! I've been accused of saying this too often, but it's my new favorite place in Paris. For real this time. So as usual, I returned from Paris with the renewed feeling that planning nothing is the perfect way to uncover an abundance of unexpected awesomeness. Around now, I'm sure the energy of la rentrée is palpable in the Parisian air, and the French are returning from their summer retreats, oblivious to what they've missed. Let's keep it that way. actually -- and i quite hate to burst your bubble -- C&N was constructed, designed, and curated for me. better luck next time?